Every consulting project follows a distinct flow, especially from the client’s point of view. Can you improve the flow—and the value—of your consulting projects? Probably. Let’s take a look. These are in-and-out, hard-hitting projects. For example, a one-day facilitation, a training session, demolition of a building (which isn’t really consulting, but sounds fun), or a few days of intense activity intended to have an immediate impact. This is an uncommon, but interesting structure. It typically revolves around a concrete, high-value goal that can be achieved in four-to-six weeks. 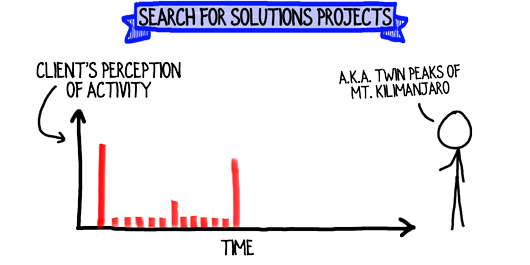 I know a few, successful consulting firms that operate all their projects in this model. Often, the consultant assembles “tiger teams” of client personnel to tackle the project. 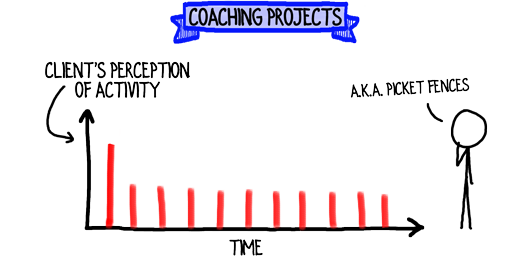 A coaching engagement launches with an assessment phase and, preferably, a complimentary shipment of chocolate from the client to the coach (just sayin’). Then the client receives a steady diet of periodic interactions until the end. 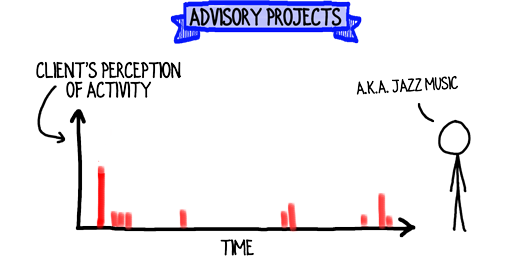 Advisory projects are the least predictable, because the client uses the consultant sporadically, when needed during a fixed period of time. Of course, your projects may look slightly different or combine a couple of options. But what’s the best flow to create value? How could you use one or more of the other project flows to accomplish your client’s outcome? Virtually every client challenge could be addressed with any of the project structures I outline above. 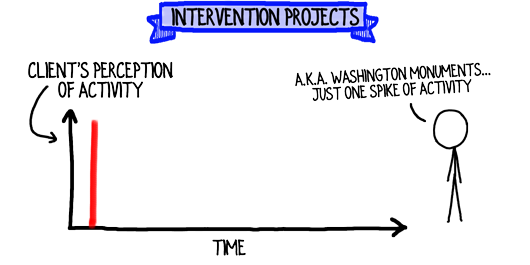 Sure, outside forces sometimes dictate the calendar, and a massive implementation project can’t be handled during a one-day intervention. However, I bet if you assembled enough resources and focus, you could accomplish a one-year implementation project in six weeks. When you experiment with project structures, your proposal will include approaches that are more compelling, intriguing, and powerful than your client or your competitors suggested. 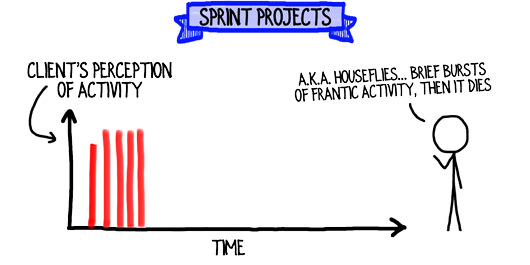 In my experience, virtually every consulting project benefits from a project flow that includes a long tail with spikes on it. Consultants generally leave the scene too early, to the detriment of the client and the consultant. The fact is, virtually every decision, plan, implementation and tidbit of advice a consultant delivers will improve with tinkering and 20/20 hindsight. Why not account for that in the design of your project? I’ve sold and worked projects with every typical flow. 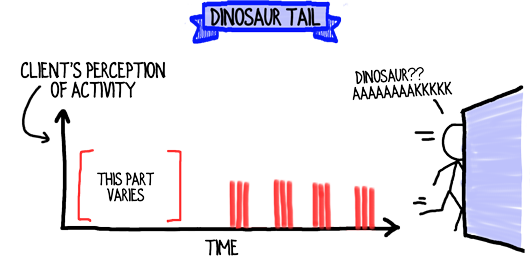 Recently I’ve focused on improving the structure of my projects, and more of my engagements are receiving dinosaur tails. For instance, I may start off the engagement with a kickoff or training day, then deliver a solution, then add a few sprints toward the end of the initiative to ensure the project is on track and accomplishing concrete goals. Here’s what I’d like to know: how could you improve the flow of your projects? Another awesome post David! I’ve been involved in projects that had most of these structures but never thought to visualize it in this manner. Your visual approach nailed the key issues right away! Your regular posts are always the highlight of my email inbox! Keep up the great work! Gosh, Mark, I’m blushing. You’ve highlighted a lesson we’ve all learned many times, yet often forget to apply: contemplating an idea visually can open our thinking to new paths and possibilities. Thank you for your lovely feedback and for your insights, Mark. David, as you noted, we all at some point have used many of the approaches you suggested but perhaps not with the clarity it requires. 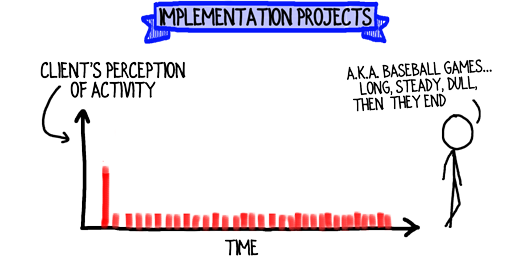 thank you for reminding the importance of how best to manage a project. Tony, clarity is always a good thing when it comes to setting up the best project. It’s easy for us to assume we know the best flow and just go with it. Spending a few minutes rethinking the project structure creates an opportunity to improve, and that’s always good! Thank you for being part of the conversation, Tony. Err, is your PO box the best place temperature wise to receive that shipment of chocolates? P.O. box works perfectly. The USPS is used to me receiving shipments of chocolate and has a special, refrigerated mail box for me. Also, I’ve learned a sophisticated approach, called RCS [Rapid Consumption Strategy], that combats melting challenges. Thanks for asking! Great post. How are those structures go with the charging models? I guess advisory structure must be charged hourly and there are no other options, while others structures can have various models to charge. Terrific question, Alex. Project structures and fee structures are, for the most part, not connected. Fee structures depend on the type of work and assignment (e.g., commodity vs. high-value; task-driven vs. outcome-driven) rather than how/when the work is performed. As a rule-of-thumb, the best fee structure for advisory projects (the example you brought up) is a value-based stipend, not hourly. I appreciate you asking the insightful question, Alex.